St. Patrick’s Day has hit Springfield in The Simpsons: Tapped Out on mobile, as EA has updated the game with new decorations, buildings, characters and quests to complete for a limited time. The event sees Homer Simpson working to become the biggest lush he can in celebration of the holiday, while little Lisa hopes to stop his excessive drinking. In this year’s St. Patrick’s Day update, players can build Tom O’Flanagan’s pub, unlocking that character in the process, as well as new actions for some characters (like making Homer and other adults go grab a drink). The Leprechaun character is also back in town. In addition to the pub, players can build the Sham Rock Cafe, complete with Green Soy Lattes. In terms of decorations, players can build themed trees and river pieces with green-dyed water, among other items. Many of the quests in this event take quite some time to complete, so players are encouraged to update their game and start now to finish them all in time. 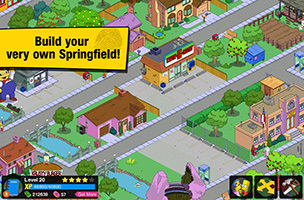 The Simpsons: Tapped Out is available to download for free on iOS, Google Play and the Amazon App Store. You can follow the game’s stats on AppData, our tracking platform for mobile and social apps and developers.